This section deals with cyclists making right turns from a main road onto an adjoining side road. See also Cycling Principles at Junctions and Features Common to Junctions. 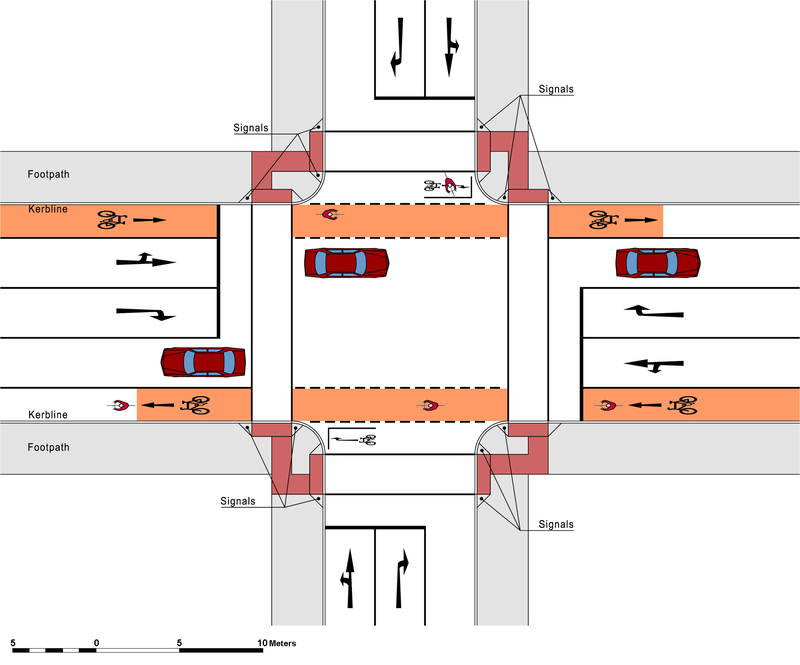 For right turns from a side road onto a main road, see Side Roads..
On single carriageway roads and street where there is a low speed traffic regime, it is possible to facilitate cyclists weaving in order to make a right-hand turn into a side street or private entrance. 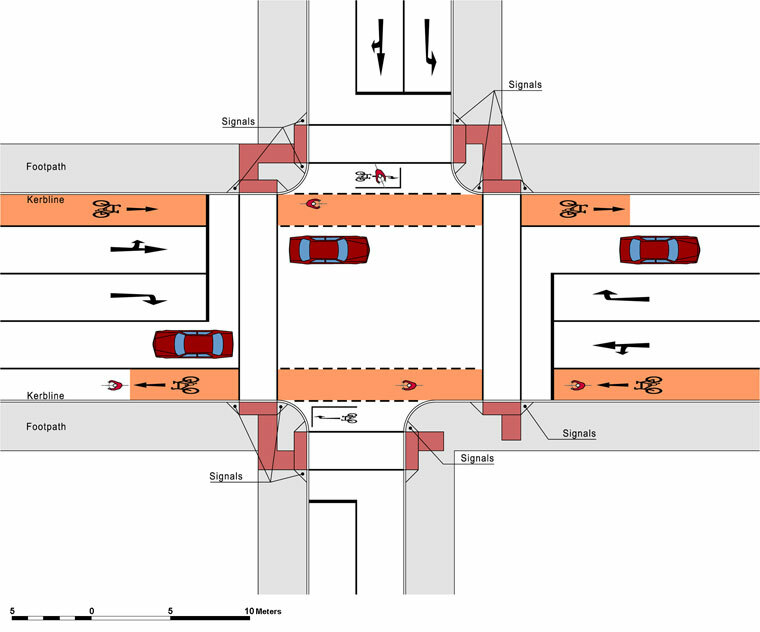 In a mixed street environment, the cyclist should already occupy the centre of the traffic lane and can simply indicate to go right, stop and wait for a gap in any opposing traffic, and make the right turn. The vehicular speed regime for this solution should be no more than 30km/h. 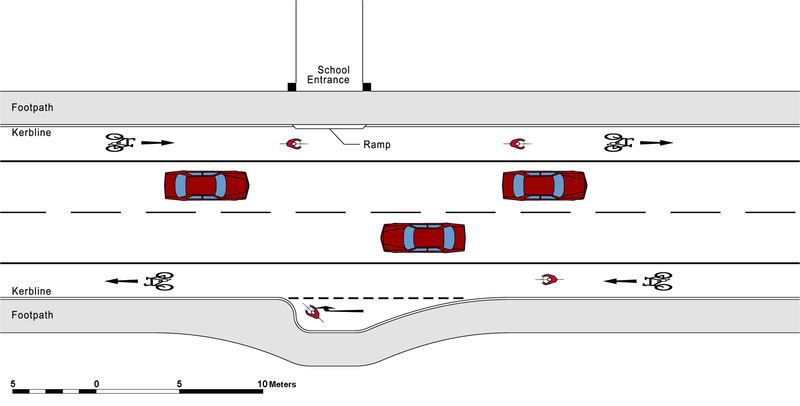 Where a cycle lanes is provided, the cyclist must signal with one hand and look over the shoulder for a gap in the traffic behind. Once in the main traffic lane, they can stop at the turn to wait for a gap in the opposing traffic and complete the turn when safe to do so. The vehicular speed regime for this solution should not exceed 50km/h. 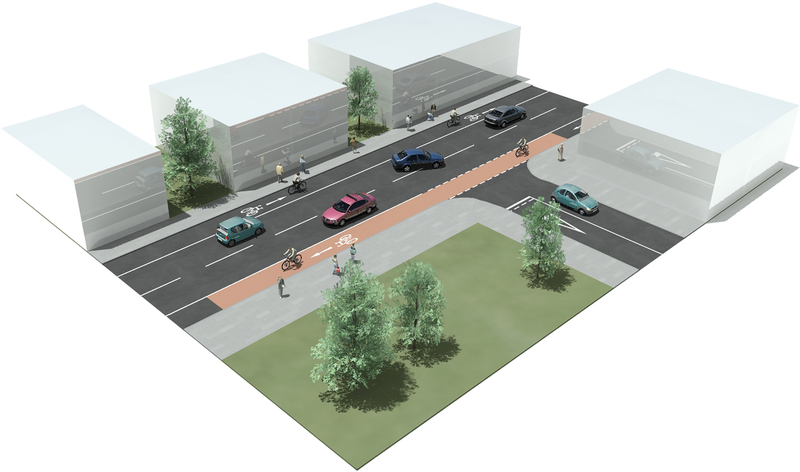 Where space permits and there is strong demand, central hatching can provide a useful informal waiting are for cyclists turning right in two stages. Where traffic volumes are high, weaving is not recommended. In such locations, it may be preferable to provide dedicated crossing facilities and these are dealt with below in Section 4.7 Crossings. 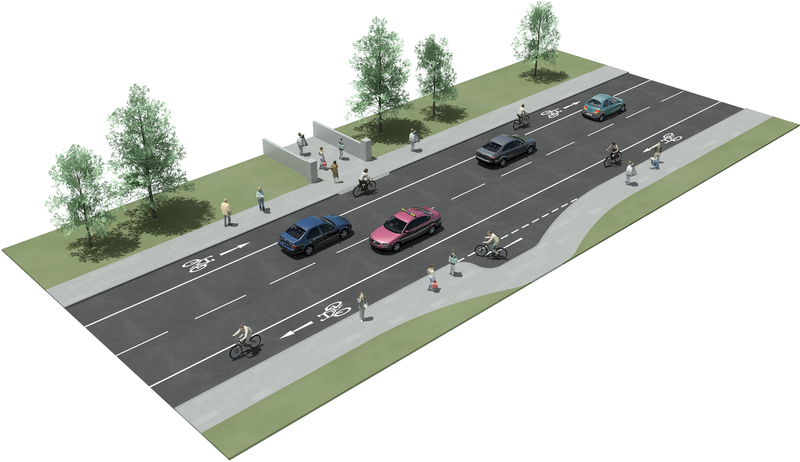 Where vehicular traffic speeds are high, as may be the case on an existing road, it may be appropriate to introduce a pinch point to passively reduce the speed of vehicular traffic and provide a safer crossing facility as part of a traffic calming scheme. See Cycle lane and Pinch Point in Section 4.7.1 below. Right turning cycle facilities at junctions, entrances and private properties along multi lane roads approaches is generally not recommended. 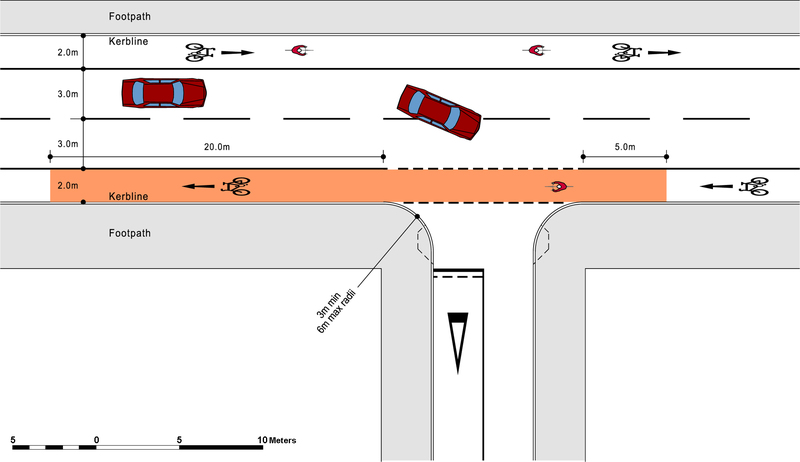 Cyclists would have to weave across at least two lanes of traffic with a much greater risk of being hit from behind. At certain junctions where traffic speeds are less then 50km/h, it may be possible to use a dedicated right turning cycle lane. This is described in the following drawing. Right turning cyclists can weave across a single traffic lane to a feeder cycle lane before traffic starts to split into separate traffic streams. 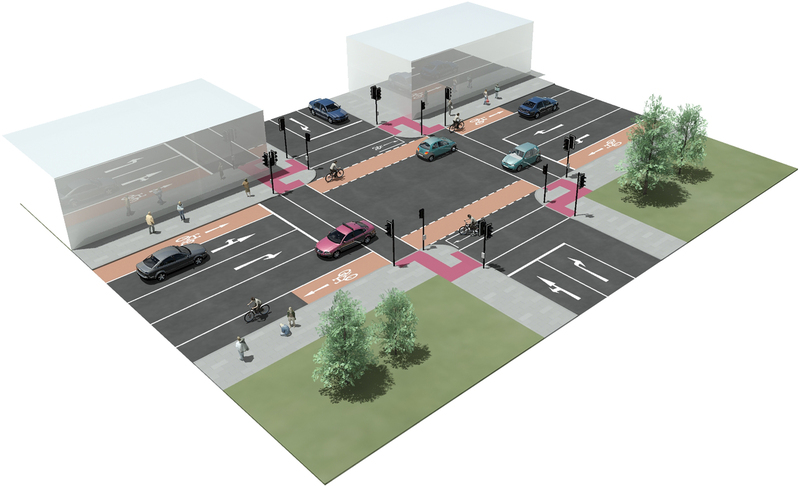 Box Turns should be used on larger signalised junction to facilitate right turning cyclists. Cyclists stay to the left of the approach, move into a stacking area at the mouth of the side or cross road, and wait for the green phase. 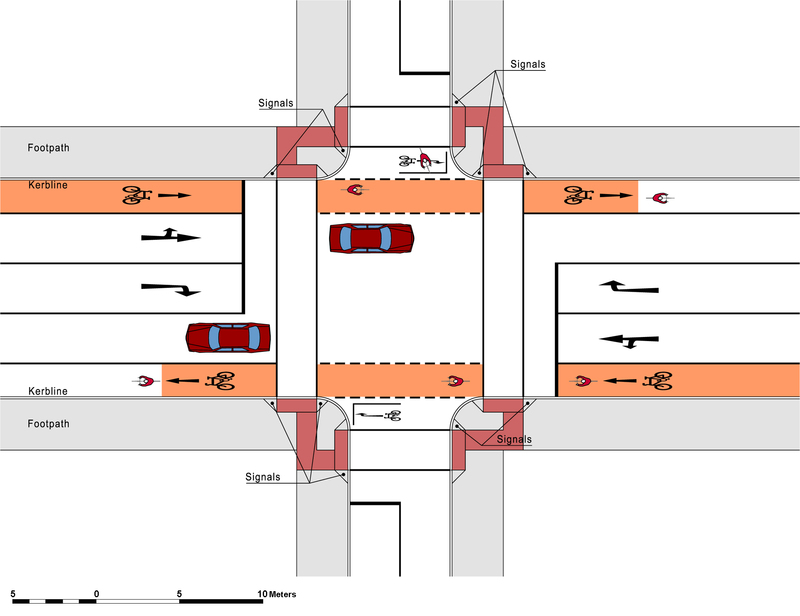 This arrangement avoids right turning cyclists having to weave across busy traffic lanes, or getting stuck between opposing streams of traffic in a junction. It also permits straight ahead cyclists to continue along the main road unobstructed. To provide a right hand turn for cyclists at junctions where vehicular traffic is not permitted to turn right. 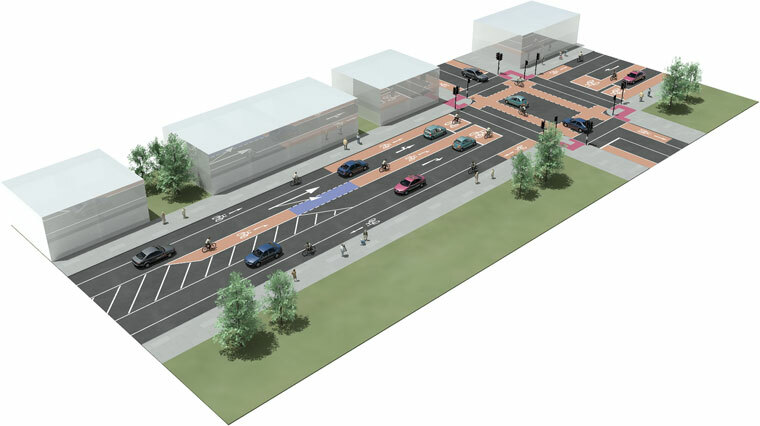 It will generally be necessary to set back the pedestrian crossing of the side road by 2.5m to 3.0m to create an advance stacking area in front of the pedestrian crossing line. The stacking area must be clearly visible and should not obstruct crossing pedestrians or straight ahead cyclists. 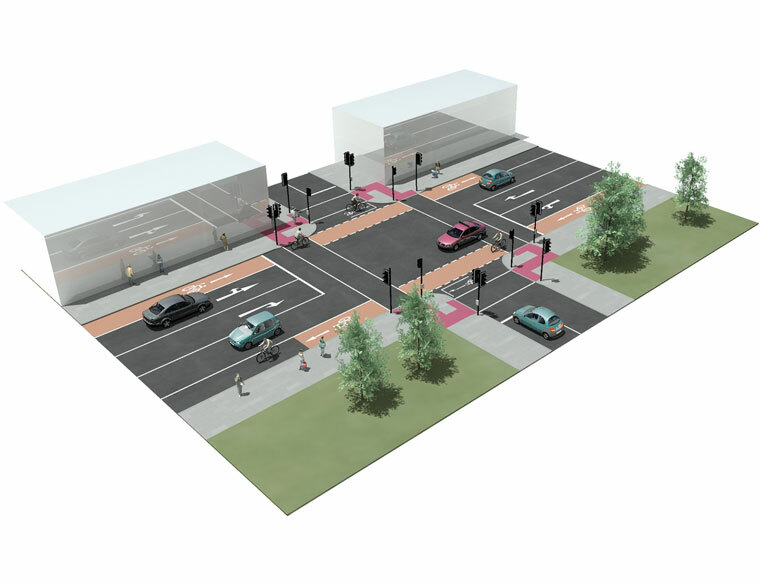 Box Turns require the presence of secondary signals for side road traffic control. Otherwise, stacking cyclists will not know when to cross. Ensure “box” on side road is located correctly i.e. 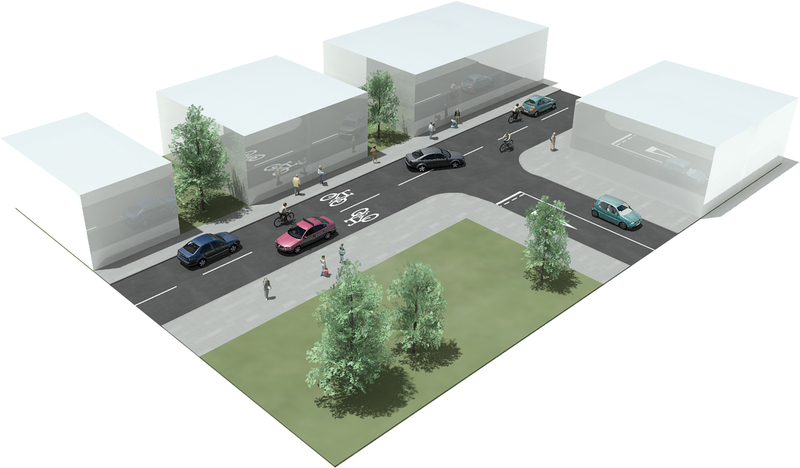 is located away from the swept path of turning traffic on main road. At multi-lane side or cross roads, where separate streams on the main and side roads are signalled to run concurrently (e.g. RH in, LH out), the position of the cyclists’ stacking box is important. Box Turn must not be located in front dedicated left lane. Box Turn must not be located in front dedicated right lane. On links where there may be high volumes of cyclists turning right, such as at a school entrance, Jug Turns can accommodate stacking cyclists while permitting straight ahead cyclists to continue through. 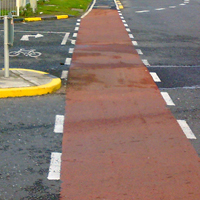 Provide bevelled kerbs / ramps to assist cyclists cross from tracks to road level etc. At toucan crossings, pedestrians and cyclists share the road space under a combined green-man and green bike signal stage, but pedestrians retain priority. Toucans are currently limited to mid-block locations. 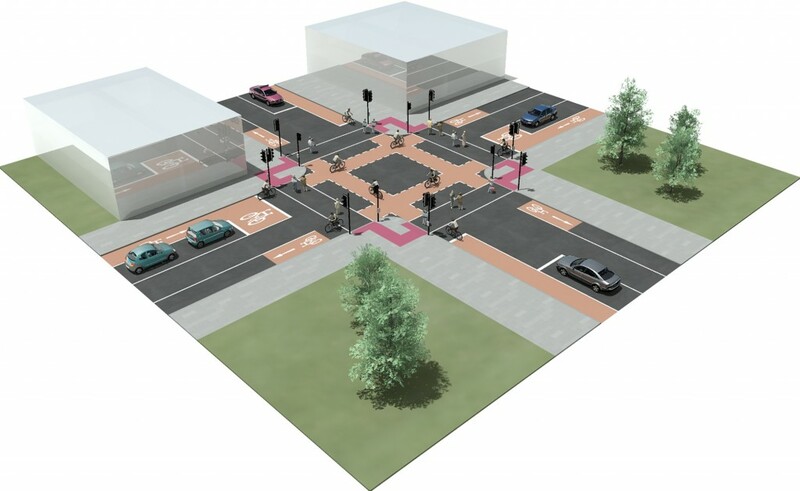 The principles governing toucan crossings may be extended to the all pedestrian phase at a junction, subject to Department approval.